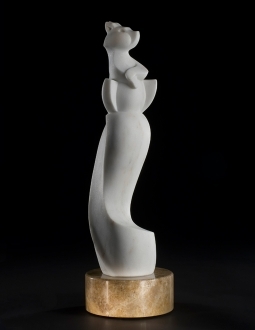 My marble squirrel, “Nice View From My Tail,” was juried into the National Sculpture Society 2010 Annual Awards Exhibition at Brookgreen Gardens in Pawleys Island, South Carolina. The show runs August 7 through October 31. I am excited to attend the Closing Reception on October 30. This will be my first time participating in a big national show. This Spring I had a solo show at the Loveland Museum Gallery of my stone sculpture, pastel drawing, and Disney animation from February 27 through April 10. The show was well-received, a ton of work, and worth every minute of the many hours I devoted to planning, writing, and installing the show. Oops, and the 3 years in Colorado and 20 years in California devoted to creating the artwork. My marble owl, “See Through Other Eyes: Spotted Owl,” was installed in downtown Loveland in May as part of The Art Advocacy Project. I am very pleased that this piece, my first venture into outdoor sculpture, was chosen for display for one year.